The Lobster was once considered to be a poor man's food , is now considered a delicious delicacy. All lobsters are invertebrates with an exoskeleton. They exhibit bilateral symmetry, unless a mutation or mutilation prohibits it from being exhibited (see below). On the head of the lobster is located antenna, which they use to feel and sense their environment. The head of the lobster is in the thorax section of its body. From the thorax extends the different types of claws (see below). The posterior of the lobster is its tail witch has flippers on the end, on a tasty note this is where most of the meat is when you eat this succulent dish. Lobsters have a decentralized nervous system  that has been compared to that of a grasshopper  . Some interesting notes to this nervous system, is that it seems that gradually increasing the temperature will lull the lobster to sleep , also when it is turned over on its dorsal side will educe a state of unconsciousness . The two main nerve clusters are located in the head of the lobster. Animal rights issues: The issue on whether lobsters may feel pain has prompted many animal rights activists to be considered with the ethical treatment of cooking these animals. There have been studies to weather lobsters feel pain, one said yes, while another one released at the same time said no. Lobsters have exhibited that they can have their crusher claw on either the right mandible or the left one . The other type of claws are the spiny legs that protrude from the thorax. Lobsters from the east coast have a pronged ends on their “feet” while spiny lobsters on the west coast taper out to a single point on the end. Lobster’s antennas pick up the scents of their prey by using the small hairs immersing the four antenna . Appendage deformities: In 1998 lobsters started emerging with gonoped deformities, scientists are yet to discover what is the cause of this mutation . Also science 1800 lobsters have been appearing with claws that look like they have multiple claws rendering out from them . Lobsters come in a variety of colors, ranging from blue to yellow to multi colored phantoms. But all lobsters turn red when cooked properly. . The unique design of the lobster eye has been intensely studied to help understand how it allows some organisms to see in low light and murky waters. Rather than bending (refracting) the light to focus the image on the retina, several of the long-bodied decapod crustaceans (shrimps, prawns, crayfish and lobsters) possess “reflecting” compound eyes. Unlike the more common compound eyes of insects, which have hexagonal facets, this unique eye design incorporates square facets that are arranged radially forming an optic array with a 180° field of view. The geometric assemblage of facets has all of the hallmarks of intelligent design and defies attempts to explain it through natural mechanisms. Simply put, these facets are tiny square-shaped tubes with walls that act as mirrors to reflect the incoming light. The walls of each facet are perfectly aligned so that the reflected light is focused toward the receptor layer flawlessly so that they all merge at the same point. The design creates an intensified, superpositioned image because the light from many facets combines to form a single image. As many as 3000 reflective facets are found in some species such as the Norway lobster (Nephrops norvegicus), and increases in sensitivity up to 1000 above the more common apposition type eye (where light remains within a single facet/ommatidium). The ability of the decapod’s eye to intensify an image that is captured from a broad field of view has intrigued engineers since the mechanism was first made known. Investigating biological systems or processes for potential use in technology is rapidly expanding field known as biomimicry. Several technological developments are now based on the unique geometric design of the lobster eye (see Lobster eye biomimicry). Researchers have developed a cosmic imaging device for use on space satellites, and a handheld imaging system was built that can view through walls of various thicknesses and materials, and identify contents. Lobsters reproduce sexually. It is possible to tell the difference between lobster sexes by checking a pair of legs on the lobsters; females are more feathery, while males are spiny. This is probably the most in-depth research into lobster mating habits , and trying to summarize it just won’t do it justice. There are some types of fisher men who despite fishing laws will scrub the fertilized eggs off of female lobsters so that they do not have to release them again. Molting is an essential part of growing, when the lobster’s biological clock hits a certain time, the process ensues. One of the first physical signs of molting is the chemicals and hormones permeating the lobster on a cellular level, with a multitude of “molting” glands. At first the tail will crack open, very slightly. While different hormones trigger different stages around the lobsters body the crack opens even more. Then the lobster slowly wiggles it’s body form the old shell, it finally wiggles free with in about 8-12 hours . The lobster will go through a rapid growth section until its new shell hardens. 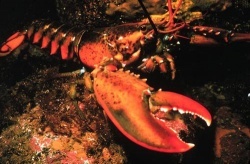 Molting in a trap: Due to a speculated reason, lobsters will begin the molting process with the thorax while in a fishing trap with other lobsters . Lobster live in salt water. From tide pools to off of the continental shelf along the bottom of the ocean floor intermixed between rocky crevices and open plains. Predators eat lobsters. Lobsters eat other lobsters when there is nothing else to eat. But primarily topping the lobsters menu are mollusks, sea urchins, clams, and fish, eel grass and algae.. Humans have turned eating lobsters into an industry. Men have braved the ocean looking for lobsters, to turn in to cash, to by the boats to look for lobsters. The lobsters fishing industry has formed it’s own triangle trade. Since the puritans landed, lobster fishing has been crucial to our trade, and food supply . For an in-depth look of how this arthropod has been entangled in our economy go to "Lobster history". ↑ The Design in Nature by by Harun Yahya. ↑ 3.0 3.1 New Design Innovatons from Biomimetics: Lobster Recruited in the War on Terrorism by Chris Ashcraft, Creation 32(3):21-23, July 2010. ↑ Sarfati, Jonathan. Lobster eyes—brilliant geometric design. Creation 23(3):12–13, June 2001. ↑ Lobster Telescope Has An Eye For X-Rays ScienceDaily April 5, 2006. ↑ U.S. Department of Homeland Security. Eye of the Lobster. S&T Spotlight, Volume 1, Issue 7. November 2007. This page was last modified on 27 July 2014, at 19:37.